A naive villager (Raj Kapoor) who has come to Calcutta is looking for water to drink. Unknowingly, he enters an apartment block where he is mistaken for a thief and finds himself drawn into a vortex of corruption and mass hysteria. As he goes from flat to flat hiding and trying to evade arrest, he discovers that these so called middle-class and respectable city people are the actual thieves and commit far bigger crimes – moral, hypocritical and physical behind the four walls of their homes…. Jagte Raho, set over a single night’s events is a brilliant comic yet critical survey of Bengali middle class life. The film is written and directed by legendary Bengali actor-director Sombhu Mitra (specially invited by Raj Kapoor to direct the film) along with Amit Moitra. Jagte Raho is one of two films directed by Mitra, the other being Subha Bibaha (1959). He is regarded one of most significant figures of 20th century Indian Theatre and is considered the greatest Bengali actors after Sisir Bhaduri, along with Ajitesh Bandhopadhyay and Utpal Dutt. The film shows Mitra’s pre-occupation with social justice and is a Chaplinesque denunciation of the petit-bourgeois who will not even offer a glass of water to a poor peasant lost by night in Calcutta. Like other films of the period – Do Bhiga Zamin (1953), Naukri (1954) and Shree 420 (1955) the film looks at the city as a nightmare. 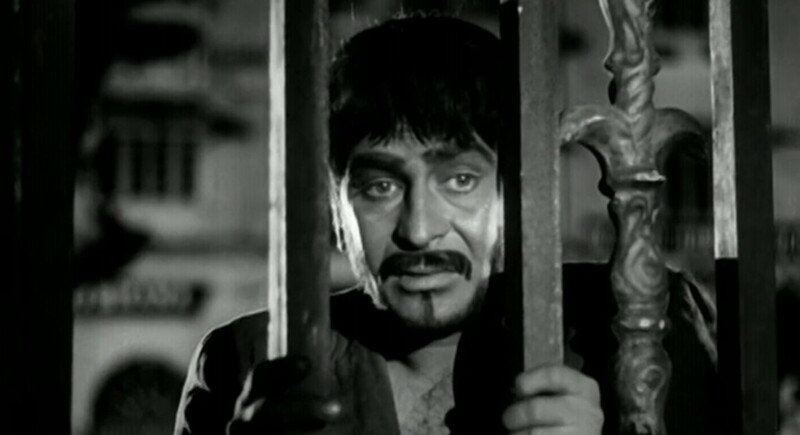 In fact the opening images are similar to those of first impresssions of Bombay in Shree 420 – the ‘closed’ nature of city life is placed in opposition to the ‘openness’ and simplicity of village life, where everyone knows everyone else: an allegory to the inhuman nature of the city where undesirable villagers are hunted down mercilessly. Jagte Raho is an allegoric film about darkness and light, where darkness is the cloak of respectability under which a city supposedly sleeps but in effect thrashes around in the throes of crime and evil – a civilization gone to seed. It seems a night without end, but there is an end, the coming of a dawn at which the peasant discovers that the terrible darkness of the night is only half the truth but out of the suffocating darkness itself shall be born the dawn of a new day of truth and justice. The device of having the peasant run into an apartment block and then having to move from flat to flat to avoid being discovered is an ingenious device as we move from one milieu to another, while also giving the film a sense of movement. The irony of the film is that while he is thought to be a thief and is chased by the so called righteous petit-bourgeois, what he sees in the flats are far bigger crimes – moral, hypocritical and physical, committed by these ‘repectable’ people behind the four walls of their homes. However the scene stealer has to be Motilal playing the role of a drunk debauch with relish. Fine support comes from the rest of the ensemble cast. The other highlight of the film is undoubtedly Salil Chowdhury’s musical score. Zindagi Khwab Hai, the haunting Jago Mohan Pyare and the robust Punjabi Bhangra song Main Koi Jhoot Bholeya are the standout numbers of the film. An interesting aside: Shailendra convinced Salil Chowdhury to compose Aaja re Pardesi from Madhumati (1958) from a piece of music used at the climax of Jagte Raho even though initially, Bimal Roy opposed the move. Jagte Raho also sees the last appearance of Raj Kapoor and Nargis together on screen. Though Chori Chori (1956) was their last film as a hero-heroine, she makes a cameo at the end of Jagte Raho and perhaps it is fitting that she is finally the woman, who quenches Raj Kapoor’s thirst and ends the film with an element of romantic humanism. A shortened version for the International market of Jagte Raho (115 minutes instead of 149) went on to win the Grand Prix at the prestigious Karlovy Vary Film Festival in 1957. Jagte Raho is one of those rare films which have stood the test of time and is, in fact, even more relevant in today’s times.